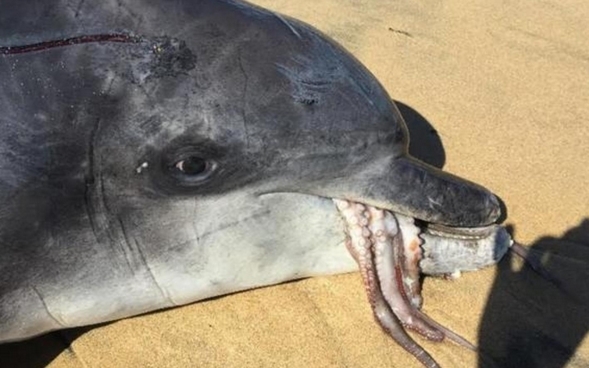 A bottlenose dolphin in Western Australia hoping to enjoy a hearty meal inadvertently ended up eating its last one after it was suffocated by a huge octopus. The dolphin tried to swallow a 2.1kg octopus but the cephalopod's tentacles blocked its airways, according to scientists. New Scientist reports that the Indo-Pacific dolphin, which researchers named 'Gilligan,' was found on Stratham Beach near the city of Bunbury in August 2015. It was discovered with the octopus' arms hanging out of its mouth and a post-mortem revealed that one tentacle extended down the dolphin's oesophagus, while seven were stuck in the back of its throat. Scientists from Murdoch University said the tentacle suckers gripped the throat walls and blocked of the dolphin's airway which caused it to suffocate. In a journal, research associates Kate Sprogis and David Hocking wrote: "A large octopus can be risky prey for predators to tackle. "This is especially so for marine mammals, such as dolphins, which don't have hands to help them keep control of this clingy, eight-armed prey." The octopus was identified as a Maori, which is the largest found in Australia. It is known as the most aggressive type of octopus which has shown a variety of behaviours such as fighting, defensive up-turning of arms and withdrawing. Dolphins use a shake and toss method to kill and tear apart the octopus. "By tossing the octopus across the water, dolphins avoid letting the octopus latch onto their bodies," the researchers said. "It's quite a process the dolphins have developed to deal with the octopus. They have a short, fused neck which means they have to arch their whole body to toss their prey out of the water.